About 1 in 8 women in the United States (between 12 and 13%) will develop invasive breast cancer over the course of her lifetime (breastcancer.org). Pink has become a universal color in support of breast cancer research. If you see products on the market that are pink or display the pink ribbon usually it means that part of the proceeds help fund organizations doing their part to fight breast cancer. With October as Breast Cancer Awareness Month, Cricket a leading beauty and hair care company that caters to meeting the needs of professional hair stylists, is doing their part by providing consumers with pink hair products. A portion of the proceeds from these pink hair products will be donated to Susan G. Komen for the Cure. This pretty, palm-sized iron makes as much of a fashion statement on your dresser as it does on your hair. Ceramic tourmaline plates reduce friction damage and ensure an ultra smooth finish while the built in comb guide detangles hair, taming every strand. Visit folica.com for more information on Cricket’s pink hair care products. My hair is frizzy, thick and very hard to tame. I have also noticed that my frizz and waves have increased over time, making it even harder for me to manage my hair. When I had the opportunity to try out a Cricket Mini Flat Iron I jumped at the chance. I’ve always wanted to own a flat iron (the one I used is their regular mini flat iron and not the pink one). This flat iron is small and cute. It even fits in my purse and would be great to use while traveling. I thought that I would need a bigger flat iron in order to be able to really get my thick hair strait but this one worked just fine and it only took about 10 minutes to get through the frizziest parts of my hair. My sister-in-law is a professional hair stylist and she told me that Cricket is a great brand. I trust her judgement and agree that she is right. 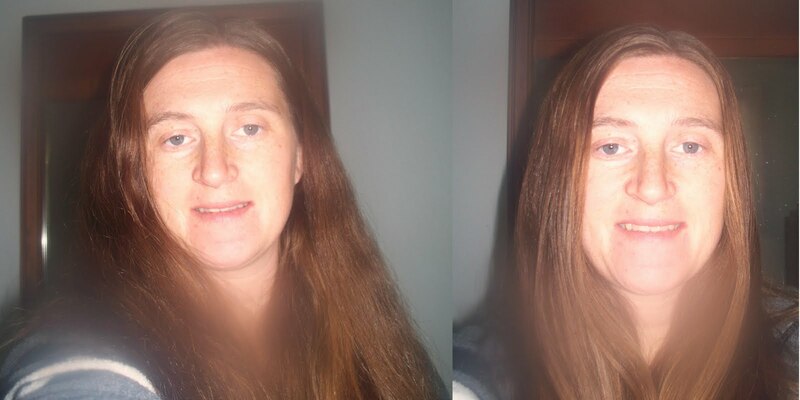 You can see for yourself how well this Cricket Mini Flat Iron works by viewing my before and after shots. 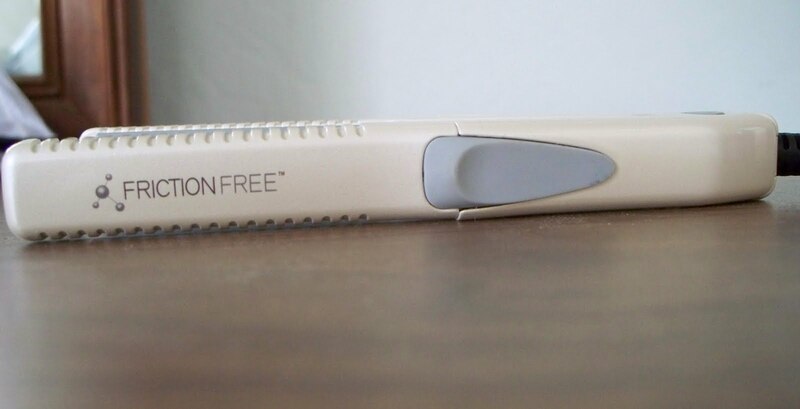 The Healthy Moms Magazine and Cricket are giving away one of their mini friction free flat irons, just like the one pictured above, to one lucky reader. All you need to do to enter is leave your e mail address along with a comment. All comments without e mail addresses will be disqualified. This contest is open to US residents only 18+ and ends on October 24, 2010 at Midnight PST. For every entry including extra entries please leave a separate comment. Winners will be chosen randomly from the comments and e mails that I receive. The contest ends on October 24, 2010 at midnight PST and is open to anyone in the US. Please leave your e mail address in your comments. All comments without e mail addresses will be disqualified. *Disclosure I received a mini flat iron from Cricket in exchange for this review. All opinions are accurate and 100% mine. Being a hairstylist I love seeing hair product companies fightig for a great cause! My flat iron broke not too long ago so my girls and I have been going without. Thanks for the chance to win!! What a great cause! the flat iron I have snags my hair so bad! I would love new one! My hair needs all the help it can get! What an excellent cause! Love it! Love companies that help out great causes! And I love that it is so small and easy to take along. Would love to tame my frizz with one of these! I need one so bad my hair looks like a poodle with a bad hair day. i am following you on twitter. My twitter name is scoobybabe2004. I'd like to see if this could help with my frizziness. Thanks. My ugly hair needs this! I could use a new flat iron. This flat iron is so cute! This is something I can definately use. I have frizzy hair and it would be great to straighten it out. Subscribe to Healthy Living Newsletter. Following This blog with Google Friend Connect. Became a Fan of The Healthy Moms Magazine on Facebook – Geri N.